People can benefit from drug rehab whether they’re suffering from mild or severe addiction. Inpatient rehab may be best for people at risk of harming themselves or others when they use drugs or alcohol and may include a combination of medication, peer support, and behavioral therapy. Drug rehab is available in many different settings, from outpatient to inpatient treatment. While rehab will differ from place to place, many utilize similar tactics designed to give a person the best chances for recovery, including a range of care tailored to meet the specific treatment needs of the individual. Many rehabs are likely to provide behavioral therapy and counseling, the most common forms of addiction treatment. Although addiction is a treatable disease, treatment is anything but simple. Effective treatment is more than just stopping the use of drugs or alcohol, and long-term care and support in recovery is necessary to achieve balance and productivity in daily life. Addiction treatment aims to help a person stop using drugs or alcohol, stay drug-free, and become a productive member of society. Drug rehab is offered in a variety of settings, and choosing the right rehab can be difficult. 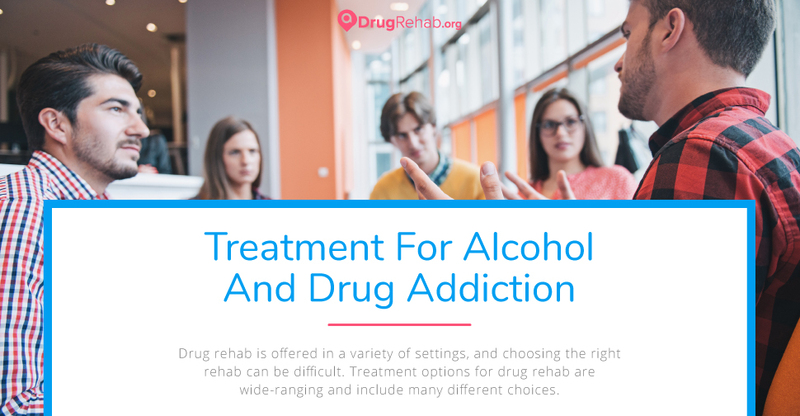 Treatment options for drug rehab are wide-ranging and include many different choices. Inpatient drug rehab is best for people suffering from severe addiction, lacking a stable support system at home, and struggling with other mental health conditions. By employing a variety of medical staff and other professionals, inpatient drug rehab can supply 24 hours, around the clock care to focus on all aspects of the individual, providing a strict schedule with a host of activities, like therapy and support groups. Long-term inpatient drug rehab refers to residential treatment lasting between 6 – 12 months. These programs are based on the therapeutic community (TC) model, which focuses on “resocializing” the individual, incorporating staff, other patients, and the entire social setting to improve responsibility and accountability through interaction. Highly structured, long-term inpatient rehab designs activities that motivate a person to reflect on their drug-seeking and destructive behavior, while working towards more harmony and balance in their lives. Long-term programs may also include employment training and other recovery services to help a person stay on track when they leave rehab. Short-term inpatient drug rehab varies in length and intensity of treatment, but usually offers programs lasting 30, 60, or 90 days in length. Likely starting with a medically supervised detox program, short-term inpatient treatment may implement intensive behavioral therapy immediately following detox. The goal of behavioral therapy is to change a person’s thinking and attitudes towards drugs, while also preparing them for a productive return to the community. These programs are more common and more affordable than long-term inpatient rehab, but still offer peer support, medical care and supervision, and access to medication and therapy. An alternative to inpatient drug rehab, outpatient rehab is delivered in a variety of settings, like a doctors office or addiction clinic. A person will continue to live at home and travel weekly to appointments with therapists or other professionals to receive group or individual counseling. Outpatient rehab is effective for people with a reliable support system and stable environment at home. Living at home can be difficult during addiction treatment, and outpatient settings may be best for people who won’t be tempted to use drugs or alcohol during treatment. Intensive outpatient programs (IOPs) provide more frequent counseling and addiction services than traditional outpatient rehab. Further counseling and services mean a person could be treated for other concurrent conditions, like mental illness. A person will still travel for treatment but may have appointments every day. By meeting more frequently, and having access to more intensive services and therapies, IOPs may last for extended periods of time, sometimes lasting longer than routine short-term stays at inpatient rehab. Individual drug counseling may be offered in both inpatient and outpatient rehab settings, focusing not only on substance abuse, but also on other issues like family and relationship problems, employment, and illegal activities. The counseling may look at a person’s individual treatment and recovery plan as a whole and work on meeting short-term behavioral goals. Although short-term goals may be emphasized, counseling will also likely work towards teaching the skills and tools needed to remain sober after treatment. The addiction therapist or counselor may encourage the person to participate in 12-step meetings and assist with other therapies and referrals if necessary. Group counseling may be offered at both inpatient and outpatient rehab, but is usually an essential aspect of inpatient drug rehab. Because inpatient rehab takes place in a therapeutic community or setting, treatment plans typically capitalize on this by offering group counseling sessions. With group counseling, people suffering from addiction can participate in peer discussions and reinforce what they’ve learned in therapy. Positive outcomes are likely when a person can share what they’ve learned in individual therapy with others going through similar circumstances. Drug rehab centers may use a variety of therapies to best serve a person’s needs. The ultimate goal of therapy is to increase healthy life skills, change behaviors relating to drug use, and motivate people to engage in treatment. There is no limit to the types of drug rehabs available. Many are likely to take place in a peaceful and quiet setting, removed from everyday distractions. A common myth associated with drug rehab is that people must want to get better to be successful in rehab. This myth is false because professionals in rehab centers are trained to help motivate people to engage in treatment, even if they aren’t ready to stop using drugs or alcohol. Peer support is a crucial aspect of recovery and an essential component of addiction treatment. In support groups, like Alcoholic Anonymous (AA) or Narcotics Anonymous, peer support has shown to reduce substance abuse and maintain long-term recovery. Sharing intimate stories with others who understand the turmoil of addiction can be a powerful way to stay sober during and after treatment. Call now for more information on treatment options for drug rehab. aDrugRehab.org is intended for educational purposes only and is not designed to provide medical advice of any kind. Any information found on aDrugRehab.org should never be used to diagnose a disease or health problem, and in no way replaces or substitutes professional care. In the case of a suspected health problem, please contact your healthcare provider. The producers, contributors, sponsors, editors, and authors of aDrugRehab.org have no responsibility or obligation to anyone (person or entity) for any harmful consequences that may happen, directly or indirectly, as a result of the content or information provided on aDrugRehab.org. In the case of a medical emergency, please call 9-1-1 immediately. Calls will be answered by a qualified admissions representative with Freedom Healthcare of America, LLC, the owners of aDrugRehab.org We look forward to helping you!